The last time I bought a new computer was in 2001, a shiny 12 inch Power Book G4. I was so happy. It was the best machine ever. I carried it everywhere I go. So cute and oh so portable. For a long long time, I was waiting for a G5 12 inch, but that never materialized. Then the Intel Mac came out. I waited patiently again for a 12 inch version, but it never happened.I was quite happy with my power book, so I waited and waited and waited. I was about to give up and get a 15 inch then the buzz of a new notebook from Apple was all around so I waited again. Then Apple announced Macbook Air. I have to admit I was tempted. It is so pretty, so thin, and light. But I wanted a machine with better spec for the price. Anyway, at that time the Mr machine broke, so he end up getting the Macbook Air. It’s a nice machine, but it’s not something I really wanted. He loves it. I decided to stop waiting and start to shop around. After a few month of soul searching, I .. gasp .. decided to go back to windows.I end up getting a VGN-TZ2000 from Sony. It’s PINK and weights 2 lbs.It’s been 7 years since I had a home machine that is not a Mac. So far it takes getting used to. Especially, I am not on XP anymore. So far I like it. It feels like I never left. Vista is really not so bad. As I was driving home tonight (In daylight! Thank you Mr DST! ), I saw someone on the street. Normally, I normally don’t pay attention to walk across the street, but he looked very familiar. Then I realize it was Mark Zuckerberg. It was odd seeing him walking down the street like a normal person with no one asking for autographs. He was engrossed in a conversation with some woman. Since Facebook is in downtown Palo Alto, I suppose at some point I would have seen him walking around town anyways. It’s weird, he look like his picture. I was tempted to take a photo with my phone, but I just wanted to go home. We walked downtown for coffee this morning and of course, I had to walk by the new yarn shop. 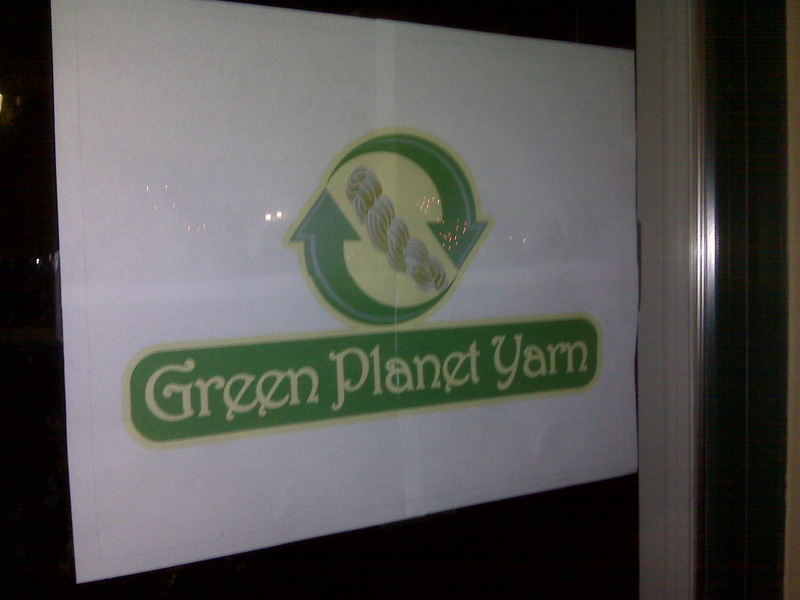 On the Green Planet Yarn website, the hours are listed as 10:00am to 5:00pm on Saturdays, so \0/! But when we walked by it was not yet open. BOO! The Shop Owner lady was inside the store looking at us leer at her. She came out and invited us in to look at her shop. She gave us a tour of her yarn and why she selected these yarn. She said the only reason she’s not open now because she’s waiting for the electricity guy to come and fix some stuff. But she’ll be open in a few weeks. I never had a private yarn store tour before so it was quite a treat! Mr was being a good sport and said very nice thing about yarns. I can’t wait until they open! We planned to go to Raman tonight, but I didn’t get home until 9:00pm. Since the weather is kind of nice tonight, we just decided to walk to downtown to Olio. It’s a nice little restaurant with lovely food. As we were walking home after dinner, I saw this. That’s right ladies and gentlemen, a new yarn store. One of a major reason I wanted this house is because there was an yarn store within walking distance. Mind you, I never walked there and never really shopped there because I didn’t really enjoy being in the shop. And the hours are just in consistent. It is kind of funny I’d rather drive to another shop than go there. Anyway, then that particular store moved away. I was sad, though I never shopped there it was comforting to know that it is there if I need to pick up supply. I meant to go visit the shop it’s new location, but I never did. One day sometime earlier this year, I drove by and it was closed forever. It made me sad. I wanted to have a yarn store that open reasonable hour that is close to the house. Anyway! I am super excited about this new store. (Mr on the the other hand didnt’ seem thrilled and mumbled about something about getting a bigger garage to hold the yarn…) It’s nice to have a local yarn store again. The hours are pretty reasonable, and it seem like a nice store. I am totally going to check it out before I pop into work tomorrow! I will have a detail review if I do go tomorrow!